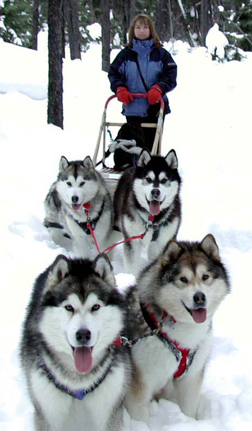 Sledding, of course, is the basis by which the Alaskan Malamute was bred. Whether on a simple plastic sled or a commercial, wooden racing sled, most Alaskan Malamutes have no problem doing this particular task. Many people find that one Alaskan Malamute simply isn't enough and more Alaskan Malamutes enter their lives. Alaskan Malamutes are not racing dogs but can run for many miles unlike their racing cousins - the Alaskan Husky, the Siberian Husky. Obviously training is key.